Water fluoridation has been a hot topic in recent news. Some organizations claim it is poisonous or that it in fact does not protect against tooth decay. In reality, fluoride is one of the biggest defenses we have against tooth decay.But don’t take my word on it! Let’s look at some facts straight from the American Dental Association. Throughout more than 60 years of research and practical experience, the overwhelming weight of credible scientific evidence has consistently indicated fluoridation of community water supplies is safe. The Center for Disease Control and Prevention has proclaimed community water fluoridation (along with vaccinations and infectious disease control) as one of the ten great public health achievements of the 20th century. Studies prove water fluoridation continues to be effective in reducing dental decay by 20-40%, even in an era with widespread availability of fluoride from other sources such as fluoride toothpaste. Fluoridation has been thoroughly tested in the United States’ court system and found to be a proper means of furthering public health and welfare. No court of last resort has ever determined fluoridation to be unlawful. Fluoride works both systemically and topically to strengthen both the enamel and root surfaces on your teeth. 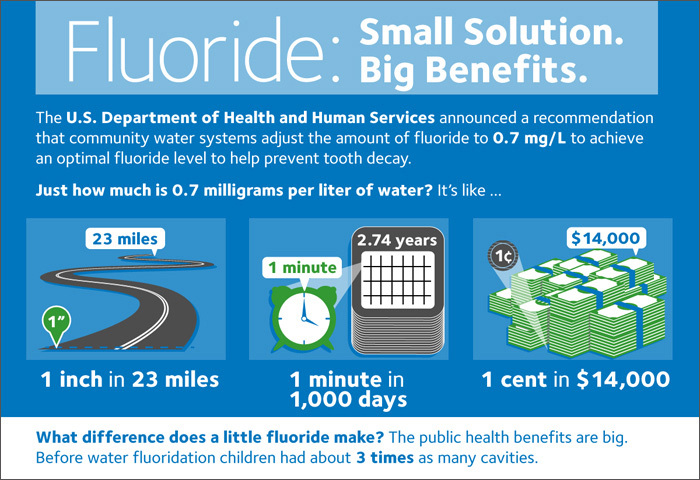 Populations with water fluoridation experience significantly lower rates of tooth decay, saving people money, time and pain. The ADA published a booklet encyclopedia, Fluoride Facts, that compiles facts and research from over 350 scientific references. Click here to be directed to Fluoride Facts. There is a lot of unsupported information shaming water fluoridation. While researching, be wary of invalid sources. National organizations that are transparent about their sources and backed up by multiple scientific studies are one of the best places to get information. The CDC as well as the ADA’s Mouth Healthy website provide well-researched information about water fluoridation. As your Raleigh, NC Dentist, all of us at Adams and Cheek Dentistry are more than happy to answer any questions you may have! Call us at (919)866-1360 or click here to schedule an appointment.